I’m not quite sure where my dream to become a professional footballer went wrong. Perhaps it was in my moody teenage years, but whatever happened I didn’t follow my childhood dream. So when I was offered the chance to watch “Rise and Shine: The Jay Demerit story”, a documentary about Jay Demerit’s journey from Wisconsin to the the World Cup via his big break at Watford, I was interested to see what Jay did that I didn’t? It’s only been 18 months since Jay last played for Watford, which in the grand scheme of things isn’t that long ago. I has half thought that it was still too soon for a biographical film when Jay is only32 years old and got a few years left him in being a professional footballer. I was very wrong. 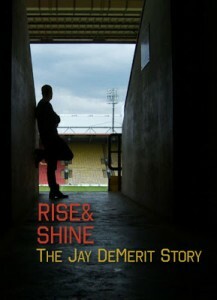 Most football fans will find Jay’s story interesting and enjoy watching it, but two groups I think will LOVE it. Firstly, young lads who still have ‘the potential’, something I lost about 15 years ago. A lot of young footballers could still be in a position where they might make it as a footballer. Are they in the Watford Academy with a mapped out journey into the first team? No, but nor was Jay. He had the vision to keep banging on doors, playing whatever game of football he could get involved with to get his break. He played organised college soccer, but was unsuccessful getting into the Chicago Fire development scheme. So off he went over to Europe to realise his American Dream. He went from not making it in a juvenile football league to trying it in some of the most competitive countries in the world. In fact I think it was his battle to get just one game of non-league football and his traveling around Europe begging for a trial was a big part in his preparation for his role in getting Watford into the Premier League and being an on pitch leader for the club. Jay made it with hardwork and determination. The other group who will love it are Watford fans. I finished watching the film having not only with the biggest grin on my face having seen clips of the Play Off winning side of 2005-2006, but my other lasting feeling was of pride. Pride in the fact that Ray Lewington and his team had the guts to take a risk on a comparatively inexperienced yank. Our club has played a big part in developing young talent that has always been, and continues to be, something that makes me proud to be a Watford fan. Lewington giving Jay his first professional contract and giving his a major bump on his way to representing his country at the 2010 World Cup finals. The club helping the development of another player, but in a very different way from the normal Academy graduate. So I never made it as a footballer or fulfil my childhood dream, however, as a life long Watford fan, watching Jay fulfil his dream of playing professional football was FANTASTIC. What a day for Watford fans and one young American! 1) How did you get involved with the project? I met Jay when he was in college through a friend named Ranko. Ranko and Jay played soccer together in college and that is where I met Jay. Around 7 months before the 2010 World Cup I called Ranko and said that we need to make a documentary, and do it now. When I talked to Ranko about it he agreed and called Jay the next day. We pitched it to Jay and he was a bit hesitant but ultimately realised it was a story with a bigger meaning, especially because he was heading to the World Cup. He was also interested in hearing what others had to say along the way, such as the guys at Watford who had a random American show up and play with the team before even training with them. That is how it all came about. Ranko and I actually had a professional director lined up but he had some family issues and couldn’t do it at the last minute. So we were forced to do it or let it fade away… and we jumped in without really knowing what exactly we were doing. We knew enough about Jay’s story and the game though to start and from there we never looked back. 2) Was it tough to get a film made about a Watford player? I think getting a film done in general is tough! Then on top of that a documentary, and one about soccer, especially in this day and age where most films are big budget comic book remakes, sequels, etc. But with all that said the technology available makes anything possible, that and a lot of work. I feel like the film is actually blessed because it could have fallen apart many times along the way but at every hurdle something happened that allowed us to keep going. Interestingly enough I think it was easier having a film about a Watford player for one reason, because of Watford FC. We didn’t come as professional filmmakers with a long resume or big film crew. However the entire club and its fans welcomed us with open arms, allowing us access to the players and the stadium and helping out wherever they could. The club realizes how special the story is and backed it 100%. 3) What was the most surprising thing you learnt about Jay and his rise out of no where? There are many things that I learned throughout the process about just how crazy and amazing Jay’s journey was. One “surprising” moment that stands out of the many is that in his try out game against Real Zaragoza (where Jay started and played the entire game even though he hadn’t even practiced with Watford before) his cleats had busted before the game so he had to borrow some because he didn’t have the money to buy new ones at the time. 4) Out of all the footballing characters you met making the film, who was the most ‘interesting’? Difficult question as everyone that we interviewed was articulate, passionate, and funny. Stu Holden is a great character. Aidy Boothryd is an extremely articulate and passionate guy and Ray Lewington is the same. However, I think the most “interesting” would be Jay’s non-league coach at Southall F.C. who would pick Jay up and drive him and his team mates to games in the back of his van.. which he also used to sell women’s underwear. 5) Is there one particular moment Watford fans should be looking out for during the movie? 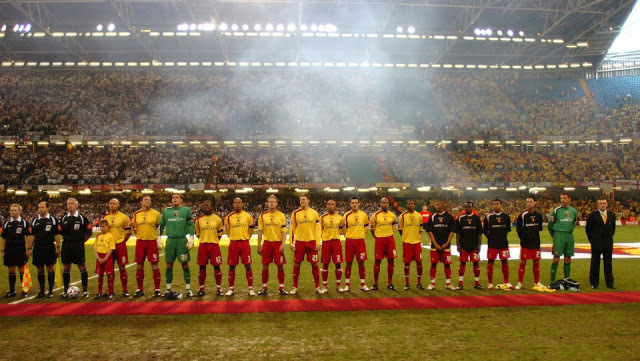 6) Where can Watford fans see the film? The film is playing at Odeon Theaters throughout the country on January 17 and January 29. It is a film for all ages and we highly encourage families, teams, and fans to go. There are a few theaters located very close to Watford that are showing the film. The entire list can be viewed at jaydemeritstory.com.